In a large saucepan, combine all broth ingredients except the salt and bring to a boil over high heat. Reduce heat to medium low and simmer until reduced by about 1/4, about 30 minutes. Strain broth and discard the solids. You should have about 6 cups. Return to saucepan, turn off heat and season to taste with salt. Preheat oven to 400°F. Lightly oil a sheet pan. Place fish on pan and brush with oil. Season with salt and pepper. Roast until fish is barely opaque when flaked in the thickest part, about 10 minutes. Remove from oven. Meanwhile, bring broth back to a boil. Cut potatoes in half lengthwise. Add vegetables to broth and drop heat to a bare simmer to reheat. To serve family style, transfer roasted fish to a platter. Sprinkle with the herbs and lemon slices. Pour the vegetables and the broth into a soup tureen. 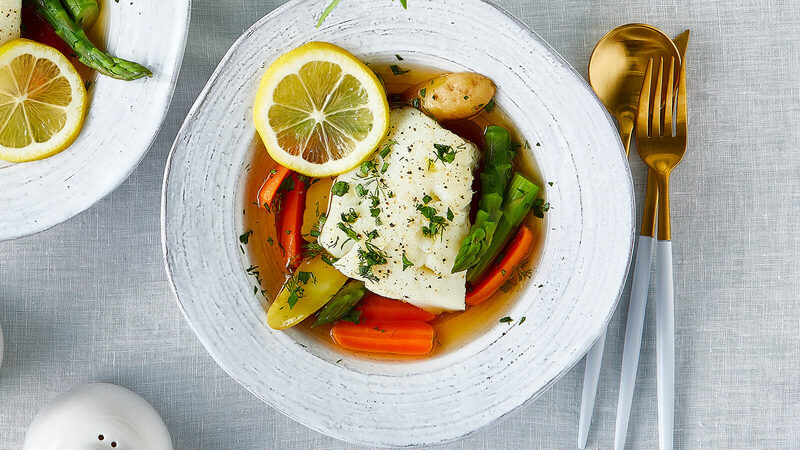 Instruct guests to ladle the broth and vegetables into a wide soup bowl and top with a fish fillet.